The 38 slides include a combination of text, images and photographs; and have speakers notes. This presentation is roughly 4565KBytes in size. This presentation assumes people know a least a little about badgers and their habits. 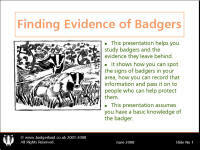 If students are new to the study of badgers, please view the “Badgers” Presentation first. Click the button below to buy a copy of this presentation. This grants you a single-person single-site licence to use this presentation. For example, this would allow this presentation to be used by a single teacher in a single school. If the presentation will be used by more than one person or in more than one school, you will need to buy multiple licences. This licence allows one person (such as a teacher) to use this presentation for one organisation. Multiple teachers or multi-site use requires additional licences. This licence does not allow you to make copies, give away, licence, sub-licence, resell or distribute this presentation.